February is not Houston’s prettiest month, at least not recently. In February of 2018, 82% of all observations at Bush Airport reported some degree of overcast skies. “Overcast skies” in this case would be defined as any observation reporting “OVC” for the cloud deck. That could be anything from a high, thin overcast with some sun peaking through to low, gray clouds or fog. Either way, some sort of grayness to the sky. So far in February of 2019, we’re averaging 85% of observations featuring overcast conditions. 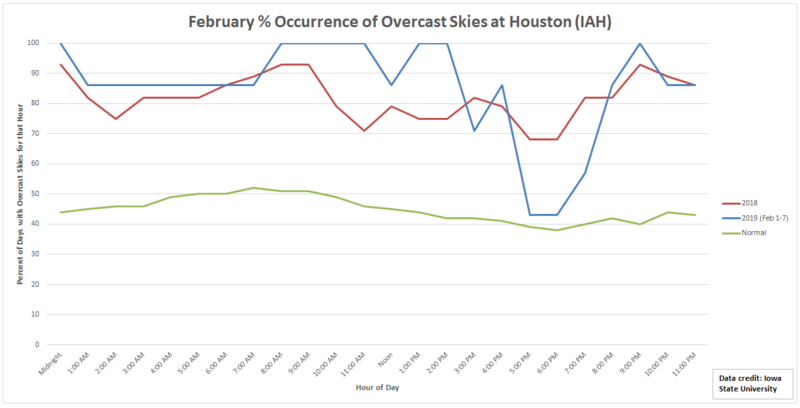 Typically in February, Houston averages about 45% of observations with overcast skies. Basically, with the exception of the time right around sunset, it’s been gloomy so far this month for the second year in a row. And this weekend will not help that cause. Winter is back in force today. How far has the temperature fallen since this same time yesterday morning? 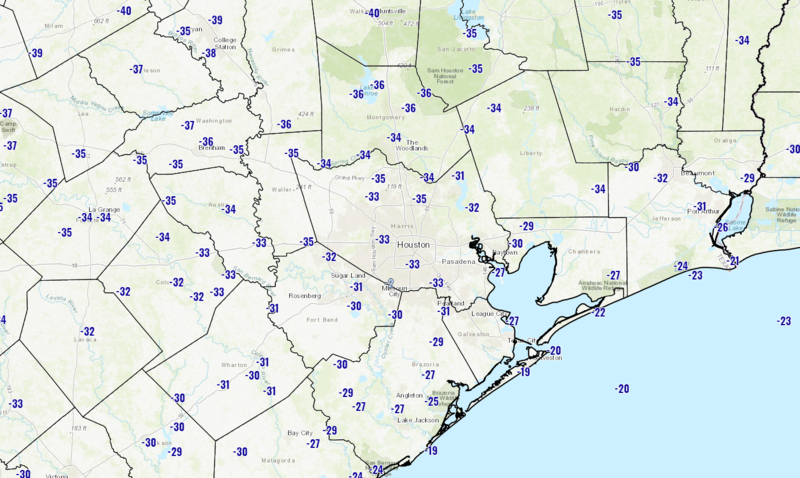 In Houston, we are running about 35 degrees colder than at this same time yesterday morning, starting today in the upper-30s or low-40s. Changes are a little greater north and a little less so south. Temperatures won’t move much today. Expect highs in the low-40s at best with a bit of a gusty north wind continuing. Cloud cover will dominate today, with perhaps a few sunny breaks if we are lucky. In addition, we could see some sprinkles or light rain, especially along the immediate coast, as well as north of the Houston area, up toward Conroe or Huntsville. Up north, any of that light rain could mix with or even fall as ice pellets (sleet). It would be conversational, not impactful, but a good reminder of where we sit on the calendar. Overall, the upcoming few days look dreary and cool, but the impacts on your weekend plans should be minimal. On Saturday, we’ll likely start with overcast skies and keep them most of the day. I would not rule out some sprinkles, light rain, or drizzle, in addition to a small shower chance. Any rain accumulation would be minor (0.10″ or less). Saturday will begin on a chilly note, in the mid- to upper-30s in Houston, cooler north and milder south. Clouds will hamper temperatures tomorrow, so don’t expect us to get much past the mid-40s during the day. Temperatures will hold steady or rise on Saturday night as onshore flow revs back up. We will start Sunday in the upper-40s and end it in the mid-60s. I’m not optimistic for anything other than a few breaks of sunshine on Sunday. There will be a minor chance of showers once again, especially west of Houston and later in the day. Onshore flow continues to increase Sunday and Sunday night. This may lead to the development of more fog along the coast and in Galveston Bay. Warm weather Monday will likely leave us with conditions similar to what we saw this past Tuesday and Wednesday. Expect clouds and fog in the morning, with some breaks of sun. Some scattered light showers can’t be ruled out Monday. Our next front arrives on Tuesday, bringing with it slightly cooler and slightly drier air. It does not appear it will deliver as significant of a change as we saw behind yesterday’s front. It will also likely have a little more moisture with it, meaning better rain chances. There are still some questions around timing and how much rain this will have, but I would plan on showers and a chance of a few storms later Tuesday and Tuesday night. We may see some sun by Wednesday or Thursday, but the weather pattern continues to look unsettled with at least some clouds sticking around. More for you on this Monday. Hey Matt! What is it that’s causing such a wet, cloudy pattern for what looks like quite a bit of Texas in these last few weeks? These fronts don’t seem to have as much staying power as normal, either. Is it a combo of the jet stream, El Niño, etc. all working together here? As always thanks for what you do! It seems to be a combination of all of the above. But truthfully, much of it is being driven by the subtropical branch of the jet stream. It’s pointed over Texas, so we have a myriad of clouds working overhead. The low clouds/fog are indirectly related, but compound the situation. And the subtropical jet is likely boosted this year because of El Nino. So everything is related in a way and unfortunately it’s all pointed right at us now. Hopefully we can unstick this later in the month. Today’s weather reminds me of back home…. highs in the low 40s and no sun for about three months straight. Sleet fell briefly in the Greenway Plaza area around noon. Yecccch. When it was 70 degrees, I got mosquito bites after just a few minutes outside. I’m happy for some weather that will wreck those little scurges.